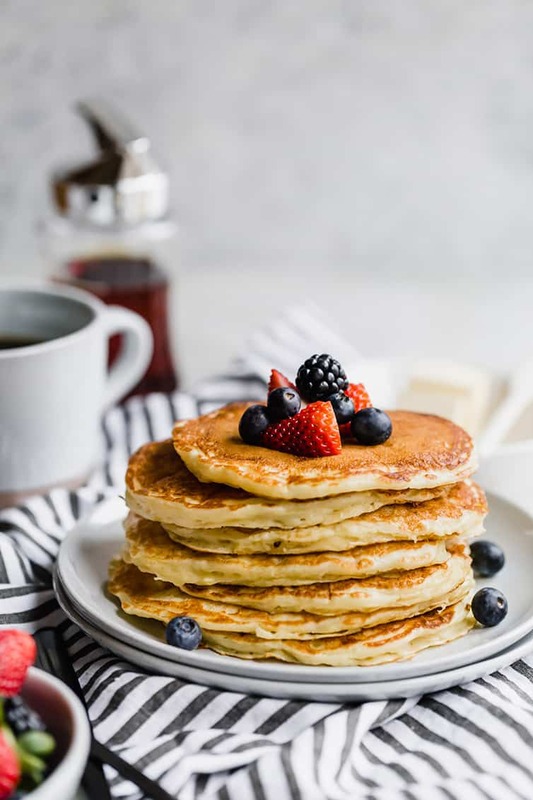 If you want the BEST, fluffiest, most perfect buttermilk pancakes made from scratch, this recipe is it! Only one bowl and a few minutes to prepare makes it an easy weekend breakfast staple (and I’ve actually made them many weekday mornings, as well!). My quest for a fabulous pancake recipe has followed a very similar path as my quest for the perfect chocolate chip cookie. Until I found “the one“, I searched high and low. If a recipe claimed to be the best, I tried it. And I kept trying until that fateful day when it was clear that I never had to try another chocolate chip recipe again. And so it has been for pancakes. Years and years ago, I set out on a quest to ditch the box mix (which I had relied on since college) and instead go all homemade, all the time. I wanted a pancake recipe I could make from scratch that didn’t take too long, and turned out perfectly fluffy and flavorful every single time. I had a previous version here that I relied on for years, but after stumbling upon a slight alteration last year, it’s the only way I’ve made them since and they are, hands down, pancake perfection. What is the key to fluffy pancakes? 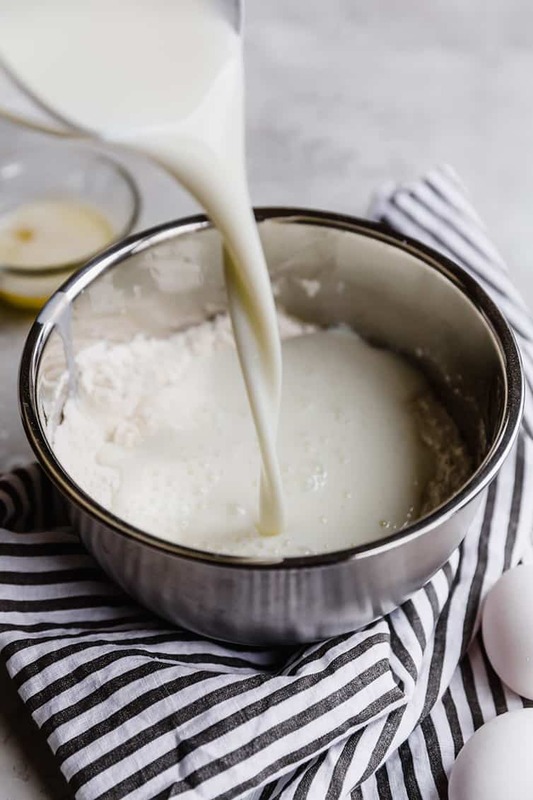 A little leavening, buttermilk to give it a boost, being sure not to overmix, letting it sit and bubble before cooking, and giving the pancakes plenty of time to firm up and fluff before you flip them. Let’s talk this through! 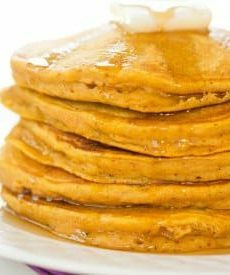 Baking Soda PLUS Baking Powder – We use a one-two leavening punch in these pancakes to give them nice lift. The baking soda reacts with the buttermilk, and baking powder gives it a bit more of a pop to ensure that these really are supremely light and fluffy pancakes. Buttermilk – A pancake staple! 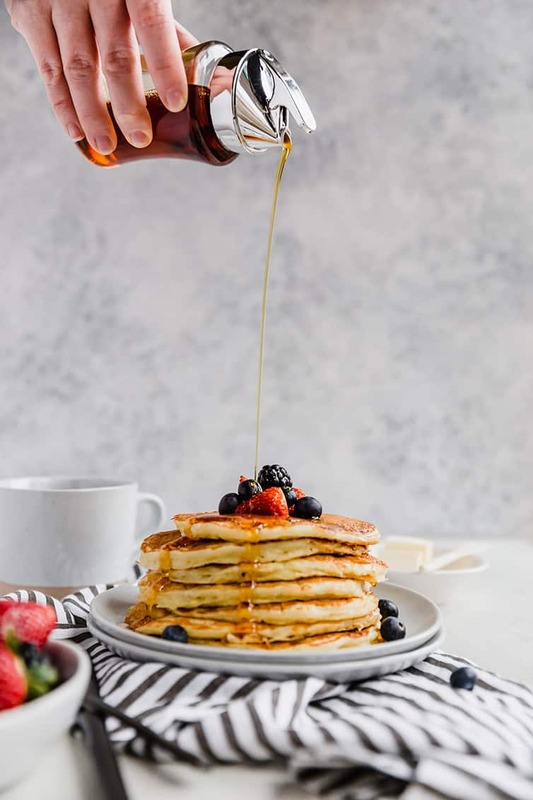 Not only does buttermilk react with the baking soda to give the pancakes extra height, but it also helps to break down the gluten for pancakes that turn out nice and tender, not tough or rubbery. 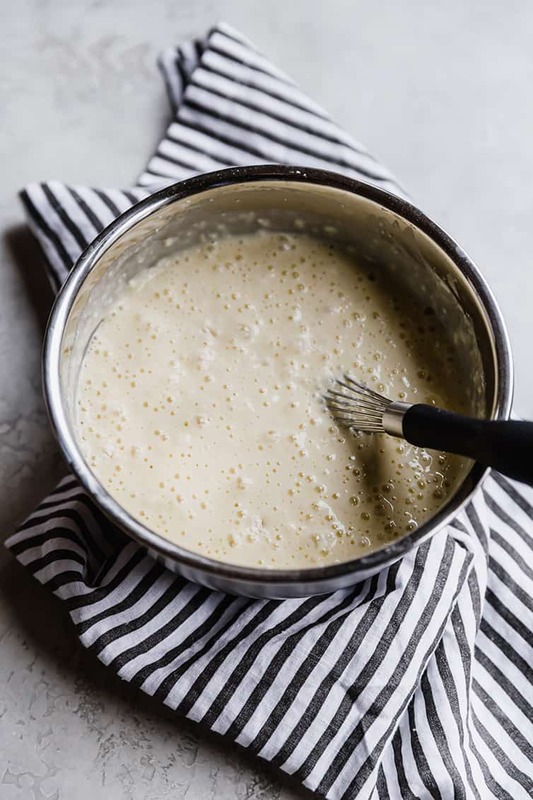 Gentle Mixing – When whisking the pancake batter together, be sure to do so gently and for only as long as it takes to incorporate the wet ingredients into the dry. Lumps are okay, you don’t want a completely smooth batter! Be a Patient Flipper! 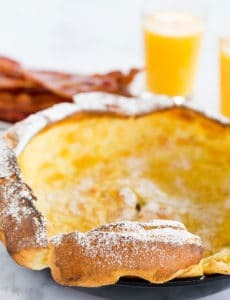 – Don’t rush flipping the pancakes; you want to give them plenty of time on the griddle (or pan) to really bubble up. This helps to set the height and ensure they are fluffy and not squashed-down, flat little sad pancakes. Most recipes call for flipping when you see bubbles, but I actually wait until the outer edges of the pancake begin to look set, and THEN I flip. Sometimes I only have a pint (2 cups) of buttermilk in the refrigerator and will use whole milk for the remaining ¼ cup and have never had an issue. Be sure not to overmix the batter; lumps are okay! Once the batter is mixed together, it can be refrigerated for up to 1 hour before cooking. You can make smaller or larger pancakes if you’d like. If you want to use add-ins like blueberries or chocolate chips (YUM! ), I recommend sprinkling them on the individual pancakes right before you flip them over. I prefer my pancakes with butter and maple syrup, but fruit and fresh whipped cream is also delicious! Wanting more for breakfast? Make a batch of oven baked bacon to have on the side! Any leftover pancakes can be stored in an airtight container in the refrigerator for up to 4 days. 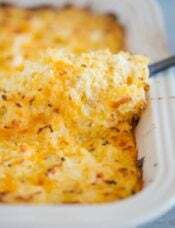 Reheat in a microwave or toaster oven. You can also freeze the cooled pancakes in a freezer-safe container for up to 3 months. My recommendations for a cast iron skillet and electric griddle (I LOVE my griddle!). We only eat pancakes a couple of times a month here, but this classic recipe has never disappointed. I always have the ingredients on hand, and it can be mixed together and cooked up in only about 30 minutes. Perfect for weekend mornings or special occasions during the week (hello birthday breakfast!). 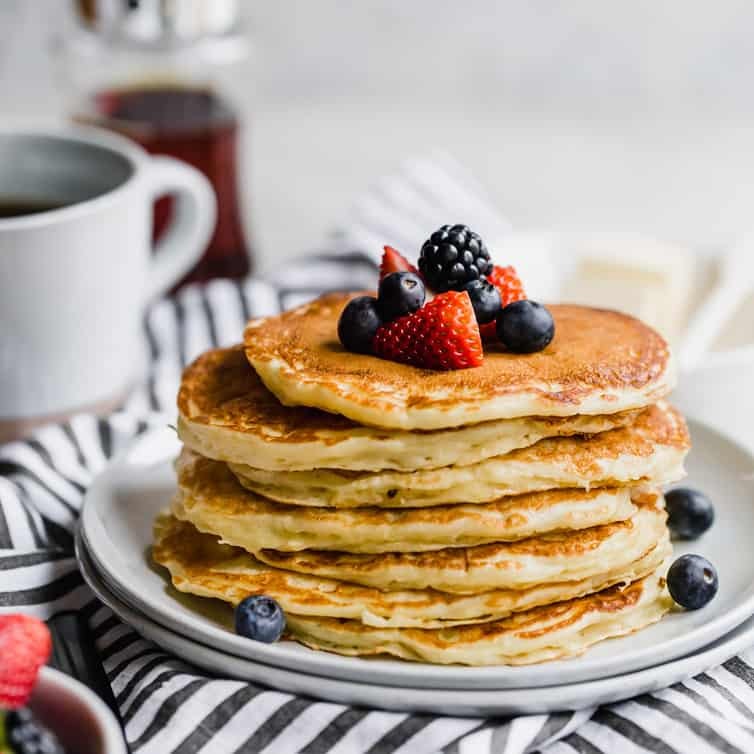 If you’ve also been on a search for THE PERFECT PANCAKE RECIPE, give these a try – you will not be disappointed! 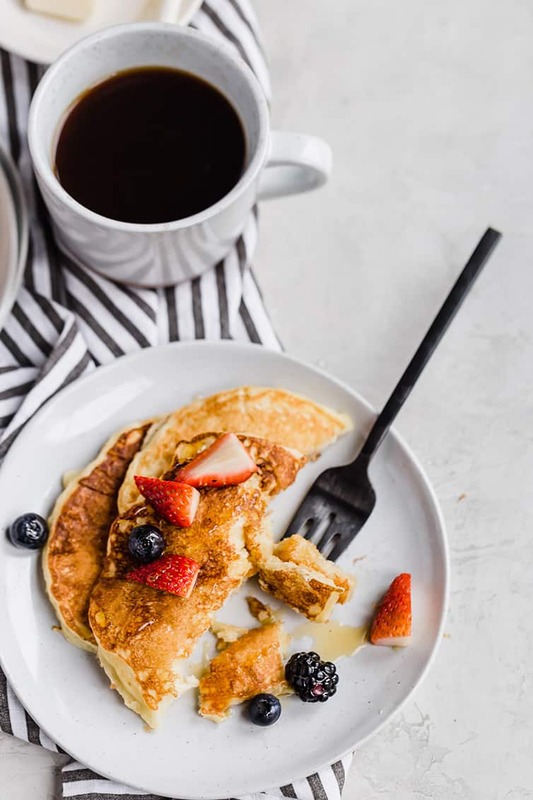 I’d love to know how you prefer to eat your pancakes – are you a butter/syrup person? Fruit and whipped cream? Something else? Share in the comments below! Whisk the flour, sugar, baking powder, baking soda and salt together in a large bowl and make a well in the center. Pour the buttermilk into the well, then add the eggs, melted butter and vanilla extract. Beginning in the center, whisk everything together, moving towards the outside of the bowl, until all of the ingredients are incorporated. Do not overmix - lumps are okay! (At this point, the batter can be refrigerated for up to 1 hour.) Allow the batter to rest for 10 minutes while you preheat your pan or griddle. Heat a large nonstick griddle or skillet (cast iron is best!) over low heat for 5 minutes. (If you are using an electric griddle, preheat it to 350 degrees F.) Add 1 tablespoon of oil to the skillet, then increase the heat to medium-low. Using 1/3 cup measure, ladle the batter onto the pan or griddle. Do not crowd the surface, even if this means only being able to cook a couple at a time. Cook until edges are set, first side is golden brown, and there are bubbles on the surface, 2 to 4 minutes. Using a thin, wide spatula, flip pancakes and continue to cook until second side is golden brown, 1 to 2 minutes longer. Remove the pancakes to a wire rack set inside a rimmed baking sheet, and keep in the preheated oven until ready to serve. Repeat with remaining batter until all pancakes are cooked. You can make smaller or larger pancakes if you'd like. Your recipe for pancakes is fantastic, it’s the best I’ve prepared, they come out delicious! !! What are your thoughts on using the buttermilk powder substitute? Hi Fran, I’ve never used it, so I couldn’t say. They looked great off the griddle. The initial bite and smell was fantastic. After several bites I could taste some type of sodium after taste. My husband was surprised at how much this recipe called for: salt, baking soda, baking powder and I noticed there was sodium in the buttermilk. Sorry, this one isn’t going to be a keeper for me and might be one that those watching sodium levels should avoid. Hi Michelle! I love your blog. 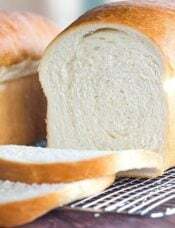 I have tried so many of your recipes and am always pleased with the results. I’ve been making pancakes since I was in elementary school… granted they were from boxed mixes and then Bisquick. About 20 years ago I started making a Buttermilk recipe which I was mostly pleased with. But I was always trying new recipes as they sprung up. My husband and I love to have pancakes for dinner. I made these pancakes last night and he could instantly tell that it was a new recipe. They were DELICIOUS! I won’t ever need to try another recipe. Enjoy reading your blog. In fact, it is the only one I read every week! Had these for dinner this evening. They are, by far, the BEST pancakes I’ve ever had. This will definitely be my go to recipe for pancakes. Thank you for this recipe!! Made these for dinner tonight and they were perfect! Quick, easy, delicious and hardly any cleanup – the perfect combination! 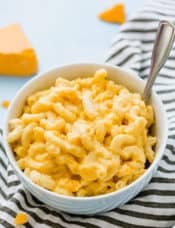 Thank you for updating and re-posting this recipe, it was just what I was looking for, I just didn’t realize it! Those pancakes look so good! I haven’t had any in quite some time! What kind of camera do you use to get those awesome pictures! Esp the ones in with the syrup! I keep the buttermilk powder on hand for these (and biscuit) occasions and it works pretty well. I recently saw a substitute comparison and actually greek yogurt (with some milk) won out as a the best substitution. My dad makes his pancakes with some cornmeal as part of the flour (say 1/3?) and it really brings something great to the table. Also, I’m all syrup all day! Thanks for everything you make! Thank you for this !I was wondering about the buttermilk substitution, myself. Made these fluffy delicious pancakes this morning. I have made lots of pancakes over the years, these were the best I have ever made. Thanks for sharing. There’s comments about sour cream in the recipe. I don’t see it the measurement for it. Thanks in advance! 1/4 cup of sour cream. Not anymore ?? Can you remind me of the old sugar measurement? Was it 2 tbsp or more than that? Have you ever tried buttermilk syrup? It’s seriously life-changing. I discovered it here: https://www.chef-in-training.com/buttermilk-pancakes-with-amazing-buttermilk-syrup/ This recipe calls for too much buttermilk in the pancake (they get runny if you add it all), so I’m going to try your ratios with the syrup! Pancakes are a favorite of mine. Never, ever use a mix, sorry. This recipe is similar to the one I have been using for so many years from a very old Betty Crocker cookbook. It says to use a rotary mixer to mix up the batter, ha! And yes, you are right, buttermilk is key. I will be trying this recipe the next time I crave pancakes. Thank you. Can’t wait to try these. My 7 year old is a pancake connoisseur. I make large batches and then freeze between squares of freezer paper. He pulls them out and microwaves for 30 seconds. It’s great for him on cold mornings before school to have a hot meal ready to go and he’s able to do it completely by himself (independence for the win!). We’re a maple syrup house, unless there are chocolate chips in the pancakes…and then we eat them just plain and enjoy the melty chocolate. What an awesome son you have! You’ll have to let me know what he thinks of these! Sour cream seems to be a key ingredient in this recipe, however I do not see it in the ingredient list. Am I missing something? Hi Louann, The recipe has since been updated to not use sour cream. Michelle – can we ask why the recipe has been updated? 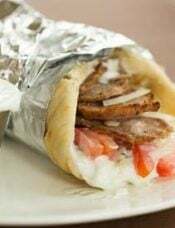 Did you find that the recipe was better without the sour cream after all or was it to simplify the recipe or something else? With the rave reviews using sour cream, I’m now conflicted on which recipe to try! 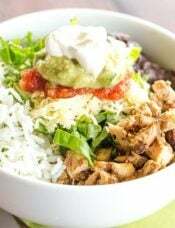 I don’t see anywhere how much sour cream to use? Hi Lisa, The recipe has since been updated to not use sour cream. I keep reading in the comments about the sour cream in the recipe but it’s not listed in the ingredients…did you change the recipe? Hi Amanda, Yes this recipe has been updated! Any way you can provide the old recipe as well? I’ve had it bookmarked for years and always go to it. My kids absolutely love it and it was a disappointment for it to be gone and I couldn’t make them this morning for my daughter’s birthday. 1. Whisk flour, sugar, baking powder, baking soda, and salt together in medium bowl. In second medium bowl, whisk buttermilk, sour cream, eggs, and melted butter together. Make well in center of dry ingredients and pour in wet ingredients; gently stir until just combined (batter should remain lumpy with few streaks of flour). Do not overmix. Let batter sit 10 minutes before cooking. 3. Heat 1 teaspoon oil in 12-inch nonstick skillet over medium heat until shimmering. Using paper towels, carefully wipe out oil, leaving thin film on bottom and sides of pan. 4. Using 1/4-cup measuring cup, portion batter into pan in 4 places. Cook until edges are set, first side is golden brown, and bubbles on surface are just beginning to break, 2 to 3 minutes. Using thin, wide spatula, flip pancakes and continue to cook until second side is golden brown, 1 to 2 minutes longer. Repeat with remaining batter, using remaining oil as necessary. This is the only pancake recipe I use! I don’t buy pancake mix anymore. I’ve made these countless times now and always get rave reviews from my family and friends. The one exception was when I was staying at a friend’s house during the winter and we couldn’t easily get to a store. She said she had buttermilk powder, which I’ve never used before. It must’ve been some pretty old powder because the pancakes were as flat as crepes. Perhaps, buttermilk powder just isn’t a good substitute. However, I always make these with really buttermilk at home.I’ve also modified the mix at times to add more nutrients for my daughter. I usually just half the regular flour and 1/2 of the other flour. I’ve used almond flour, teff flour, and spelt flour. My family preferred the almond flour, it made the pancakes even fluffier. The spelt flour worked well. Neither my husband nor my daughter liked the teff. I’ve also added 2 tablespoons of cocoa powder and a few chocolate chips for some fun pancakes.Thank you for the recipe! It’s been great to have in my arsenal. Made these tonight and they were delicious! 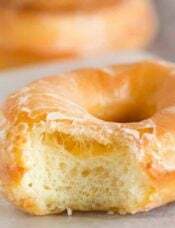 I must say I was a little nervous about leaving the batter so lumpy, but trusted you, given all the recipes I have tried of your that turned out so well. A new staple at our house I believe. My family loves buttermilk pancakes. I will have to post my mother’s recipe here so you can look it over and give me your thoughts. probably the most important ingredient in HoJo’s pancakes is malt powder. Hi Jose, Thanks so much for sharing! I haven’t made the stuffed French toast yet! Sift dry ingredients together. Mix wet ingredients and add to dry. Stir just til moist. Add 2 Tvsp. Milk if you want thinner batter. These are THE BEST buttermilk pancakes I have ever made. PERFECTION! That’s all that needs to be said.